Today Amazon announced the Kindle DX , a large screen version of the popular Kindle 2 . 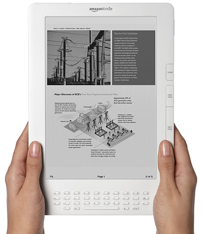 This device has a 9.7″ display (compared with the Kindle’s 6″ display), can hold 3,500 e-books, and has native PDF support. It has widescreen support – just turn the device on it’s side.